Former Nazi death camp guard John Demjanjuk will be deported from the United States to Germany on Sunday, a spokesman for the German Justice Ministry told CNN Thursday. German authorities issued an arrest warrant for Demjanjuk on March 10, accusing him of being an accessory to 29,000 counts of murder as a guard at the Sobibor death camp from March to September 1943. He is expected to arrive in Germany on Monday, Justice Ministry spokesman Ulrich Standigl said. Munich state prosecutors will question him with a view to bringing charges against him, they said in a statement on March 11. German authorities studied an identification card provided by the U.S. Office of Special Investigations, and concluded it was genuine, before issuing the warrant, the statement said. Demjanjuk denies having been a camp guard, saying instead he fought in the Soviet army and later was a prisoner of war held by the Germans. Nazi hunter Efraim Zuroff of the Simon Wiesenthal Center told CNN that he was “thrilled” at the news of Demjanjuk’s deportation, which has long been dependent on which country was prepared to accept him. Demjanjuk has asked the Department of Justice for an administrative stay of the deportation order, his American lawyer John Broadley told CNN. It could be “several months” after his arrival in Germany before Demjanjuk is brought to trial, his German lawyer, Guenther Maull, told CNN. Demjanjuk will be offered the chance to make a statement after his arrest warrant is read to him when he arrives in Germany, and then court procedures will begin, the lawyer said. Demjanjuk will be kept either in Munich Stadelheim prison or a clinic, depending on his health, while awaiting the court’s decision, said Maull, who added he has never spoken to Demjanjuk. Demjanjuk, 88, has been fighting charges of Nazi war crimes for well over two decades. He was extradited from the United States to Israel, where he was convicted in 1986 of being “Ivan the Terrible,” a guard at the notorious Treblinka extermination camp. The conviction was overturned by Israeli courts on appeal and he returned to the United States. 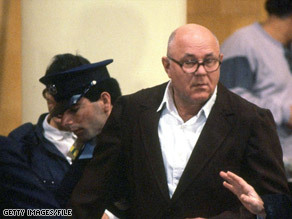 The United States filed new charges against him in 1998, again alleging that he had been a concentration camp guard. A federal judge found in 2002 that Demjanjuk had been a guard at the Sobibor death camp, where a quarter of a million people were killed during World War II, and at two other concentration camps. Prosecutors argued that Demjanjuk concealed his history when he came to the United States in 1952. He was stripped of U.S. citizenship and has been awaiting deportation since 2005, despite fighting his case all the way to the Supreme Court. A retired auto-plant mechanic, Demjanjuk is originally from Ukraine.